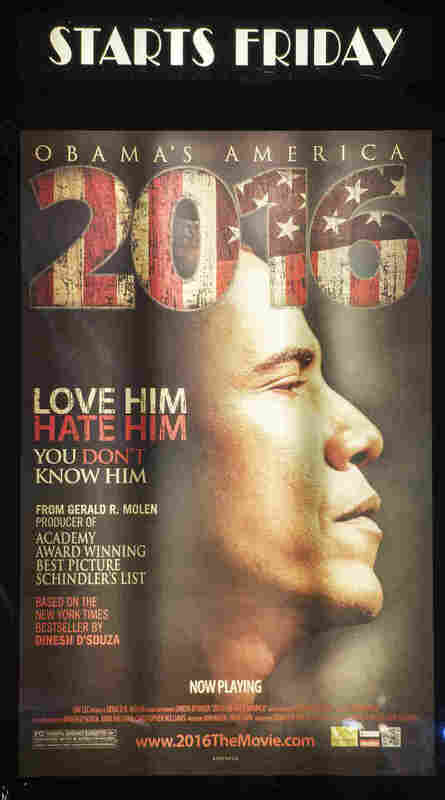 '2016: Obama's America' Shows Up Strong When Most Box Office Is Weak A new film looking at a possible second term for President Barack Obama is already the sixth-highest-grossing political documentary of all time. Check out the latest NPR coverage of President Obama's bid for re-election in 2012. A promotional poster is seen at the Rave Fairfax Corner movie theater in Fairfax, Virginia, announcing the new movie "2016: Obama's America" that opened in theaters across the US, August 24, 2012. The movie 2016: Obama's America just did something that's hard for any political documentary to accomplish: it took seventh place on the list of this weekend's highest grossing movies. Usually, when any documentary pulls in more than five million dollars, it's about, say, Katy Perry. But 2016 looks at the ideologies and global movements that it says helped intellectually mold the President of the United States from a critical, conservative perspective. And the ending imagines an America economically undone by four more years of an Obama presidency. During the three years writer Dinesh D'Souza worked on the documentary, he traveled to Kenya to interview George Obama, the president's half-brother, as well as to India to create something of a parallel between his story and Obama's. The attention the film's received from Rush Limbaugh and Fox News has helped it expand from one screen in Houston when it opened six weeks ago to over 1170 screens nationwide, says producer Gerald Molen. When I asked why he made a film intended for movie theaters, rather than use the web or television to reach audiences, Molen replied, "Michael Moore did very well with his documentaries." As a producer whose credits include such films as Jurassic Park and Schindler's List, Molen is using the medium he knows best to communicate his political beliefs. And so far, 2016 has made more than nine million dollars. It's already the sixth highest grossing political documentary of all time. Analyst Jeff Bock, of Exhibitor Relations, says 2016 might not have done quite as well if its distributor had been released the film earlier in the year. "End of the summer's always the weakest time at the box office," he says. "So it was a great move by Rocky Mountain Pictures to drop their political documentary in this spot." Bock expects Obama 2016 to keep attracting audiences over the next few months, as the weather cools and the election heats up. In fact, Gerald Molen says his goal is for nothing less than for everyone to see the film. "I realize that's outrageous," he said, "but, sure, if there's a goal, that's what I would seek."